Domesticate, as defined by the Merriam-Webster dictionary, is to adapt (an animal or plant) to life in intimate association with and to the advantage of humans. From our evolution course we know that adaption means a characteristic that increases the Darwinian fitness of an individual compared to individuals without the trait. (We recall that Darwinian fitness is the ability of an individual to survive and reproduce in its environment.) Thus, domestication is the change in an organism to make it better suited to life with humans. Moving away from definitions, if you take a look around you, you will see myriad domestic organisms. For example, your pet dog or cat or rabbit are domesticated animals. The houseplants that you forget to water are domesticated. The daffodils and tulips planted in your mother’s garden, the magnolia tree that stands by the backdoor, and the aromatic lavender patch along the pathway are all domesticated plants known as ornamentals. According to Gessert’s paper, “Flowers of Human Presence: Effects of Aesthetic Values on the Evolution of Ornamental Plants,” certain plants were domesticated based on the selection for aesthetics. These included characteristics such as color, pattern, size, form, and texture (and aroma, which ties into a plants aesthetic value). Humans chose these traits not for the "good" of the plant but because they appear visually (and olfactory) stimulating. The selection for visual aspects of flowers has caused convergent evolution. Species in the Tea, Ranunculus, Nightshade, Rose, and Poppy Families all exhibit informal doublets – many petals of varying sizes and shapes. Species in each of these families were selected for the similar flower trait. Thus, these flowers resemble each other due to convergent evolution of the selected upon trait. Gessert, George. 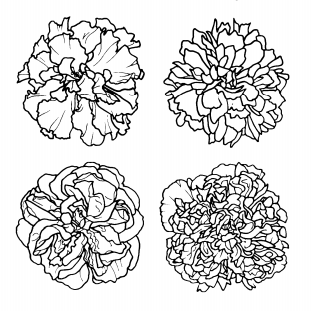 (1993) Flowers of Human Presence: Effects of Esthetic Values on the Evolution of Ornamental Plants, Leonardo 26.1 (37-44). Is there any advantage to having an informal doublet? For example ,does having an informal doublet aesthetically please pollinators as well, increasing the flower's likelihood of pollination? In other words, would these species not survive if it were not for the direct selection by humans? Are there wild species of these flowers without informal doublets that survive, or have they evolved entirely to include doublets? Human selection on nature is driven by profit not just aesthetics. We tend to "select" things out that have high market value (flowers with certain color, dogs and cats with certain characteristics, crops that can withstand pests and other harsh conditions). Personally, I am not too surprised that the flowers grown in our home gardens are not completely natural. It seems that we as humans tend to want things to look in a particular manner, and to obtain this desired result we have to tweak things, hence domestication. If someone wishes to buy a bouquet of red roses, not any old bunch of roses will due in the commercial world. We want the best color, the fullest blossom, and the most fragrant smell to feel that we are getting our money's worth. A rose springing forth from the wild most likely will not be able to provide us that so selective breeding has lead to the species we find today. Is this necessary or beneficial in an evolutionary sense? Most likely not. However, we are not expecting these flowers to be successful in the wild, so the means justify the ends in this case. I wonder what effect human domestication of flowers has had on other wild flower species. Has human selection caused the complete extinction of certain "less appealing" species? Like Angela, I'd like to know if human domestication has also caused a change in pollinator preferences/adaptations, thus causing a shift in fitness of wild flower species?